The Department of Epidemiology supervised by Dr. M. Deepa was started in 1996 with the objective of studying the distribution and determinants of diabetes in the population. The first study, the Chennai Urban Population Study (CUPS) looked at Intra urban differences in diabetes with respect to socioeconomic status. This resulted in 34 publications and three PhD. This was later followed by the CURES, the Chennai Urban Rural Epidemiology Study, which was a sample survey for diabetes in Chennai city. Several national and international publications evolved from this study, which also bought in recognition and collaboration with renowned universities, both within India and abroad. This study also saw the section maturing into a department and was followed by several other national and international studies which are described below. To provide solid evidence based knowledge on diabetes, its determinants and methods of control in the populations that would provide a basis for health action. To work towards developing a strong data base on the epidemiology of diabetes and to develop methods for population based management of the disease. This was the first epidemiological study carried out by MDRF between 1996 and 1998 to look at the intra urban differences in the prevalence of metabolic syndrome. This study reported on the prevalence of diabetes, impaired glucose tolerance (IGT) and other features of the metabolic syndrome like insulin resistance, hyperlipidemia, hypertension and obesity in two socio economically different sections of society within an urban environment and also reported on the differences in risk factor profiles within these two strata of society. Two residential colonies were selected in urban Chennai, representing middle income and low income group. This cross-secional field survey was conducted in these two colonies and all individuals aged ≥20 years residing there were invited to participate in the study. Of the total 1,399 eligible subjects, 1,262 individuals participated in the study. Several publications have come out from this study. Chennai Urban Rural Epidemiology Study (CURES), started in 2001, is a large epidemiologic study involving a representative population of Chennai with the main objective to estimate the prevalence of diabetes and its complications in urban Indians and to identify the risk factors for non-communicable diseases (NCDs). 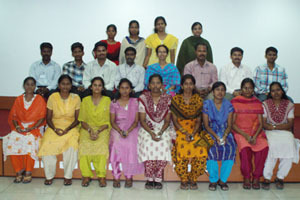 CURES studied 26,001 individuals aged 20 years and above in Chennai. To date, more than 70 publications have resulted from CURES. The Prospective Urban and Rural Epidemiological (PURE) study, is a prospective cohort study that will track changing lifestyles, risk factors and chronic disease using periodic standardized data collection in urban and rural areas of 14 countries: Argentina, Brazil, Canada, Chile, China, Colombia, India, Iran, Kenya, Russia, South Africa, Thailand, United Arab Emirates and Zimbabwe. The main objective of this study is to determine whether variations in the structure of urban and rural societies lead to differences in lifestyle, including nutrition, physical activity patterns and psychosocial stress and whether these in turn lead to the development of risk factors for coronary heart disease. MDRF is one of the five centres in India where the study is being carried out. The WHO stepwise approach for non-communicable diseases is a large multi centric cross–sectional survey conducted in five centres in India using standardized protocol. The main objective of the study is to develop modules for surveillance of major NCD risk factors within the region, and secondly to formulate and implement the methodology for NCD risk factor surveillance which can be later translated to the national / existing health information systems. To implement prevention of diabetes at three levels i.e. Primary prevention (prevention of diabetes itself), Secondary prevention (prevention of diabetes related complications by good diabetes control) and Tertiary prevention (prevention of end stage complications and providing rehabilitation measures) in a rural area in Tamil Nadu in southern India as a model for prevention of diabetes in rural India and other developing countries. To encourage community participation and empowering the local people especially women and youth to become educators and spokespersons to adopt a healthy lifestyle and thereby play a significant role in preventing diabetes in the family and in the community at large. To screen for diabetes (self reported plus newly detected) and ‘pre-diabetes’ i.e. impaired glucose tolerance. To screen for diabetic complications in diabetic subjects in rural areas with particular respect to eye, foot, kidney and heart complications using telemedicine as a novel tool. This is the surveillance project of non-communicable diseases proposed to be carried out in all states in India by Indian Council of Medical Research (ICMR) and the Ministry of Health and Family Welfare, Government of India. For the state of Tamilnadu, MDRF has been designated as the surveillance centre to conduct this project. To estimate the prevalence and distribution of risk factors of NCD’s in different strata in various States/ Regions of India. To establish a data base of NCD risk factors and monitor trends of important risk factors over a period of time. To support evolving strategies and interventions of identified risk factors to reduce the burden of diseases due to non-communicable diseases. This study was conducted to externally validate the diabetes risk score developed by MDRF. Indian Diabetes Risk Score [IDRS] was developed based on the phase 3 data from CURES. This simplified Indian Diabetes Risk Score is useful for identifying undiagnosed diabetic subjects in India and could make screening programmes more cost effective as it can reduce the cost by 50% if replaced for screening programmes with blood sugar estimations. IDRS Validation study was conducted to externally validate the risk score. To establish sentinel surveillance of cardiovascular risk factors, cardiovascular mortality in industrial population. To impart health education to the industrial populations in prevention of cardiovascular diseases. To determine the nutritional component in sub samples of the industrial population. The ICMR-INDIAB study is to date the largest epidemiological survey undertaken by MDRF. This study, conducted in collaboration with the Indian Council of Medical Research, aims at determining the nationwide prevalence of diabetes mellitus, by estimating the statewise prevalence of the same. The study will involve individuals aged 20 years and above, from all the 28 states and two of the Union Territories of India. In addition to finding out the prevalence of diabetes, ICMR-INDIAB is also expected to provide valuable data on pre-diabetes in India, as well as parameters such as hyperlipidemia, and hypertension. The study will also enable us to compare the prevalence of diabetes between states and regions of India. The objective was to study the influence of parental history of type 2 diabetes mellitus on prevalence of the metabolic syndrome (MS) and other Cardiometabolic risk factors in Asian Indian adolescents. This is a cross sectional, case control study. This study showed that parental history of type 2 diabetes mellitus increases risk of not only glucose intolerance but also other cardiometabolic risk factors like overweight, low high-density lipoprotein cholesterol, and high blood pressure in Asian Indian adolescents. The main objective of this study is to determine the genetic basis of diabetes and its complications. Large families with several diabetic subjects were selected from the pedigrees collected from the CURES study and all the adult family members (aged ≥20 years) were invited to participate in this study to determine the genetic basis of diabetes and its complications. The aim of this study was to determine the prevalence of diabetes, metabolic syndrome and obesity among subjects with schizophrenia. Population Experiences, Awareness and Conceptions of Health (PEACH): This study was conducted by a student from Michigan University, Ms. Heather E. Lanthorn, with the main objective to look at the perceptions about risk factors for non communicable diseases in urban south India. Project done by student’s from Emory University, USA. Caregiver child feeding practices in Asiad Colony, Chennai. Diabetes related knowledge and behaviour among adolescents(12-16years) in Chennai, India. Assessing Health Related Quality of life in Patients with Diabetic Retinopathy and Diabetic Macular Edema. The Department has carried out several major epidemiological studies, which have provided significant indigenous data on diabetes and other non-communicable diseases. CUPS represented two residential colonies in Chennai focussing on low and middle socio-economic group. From CUPS, we moved on to CURES, which was properly sampled and represents the whole Chennai city. CURES paved the way for the future and recognition to undertake a World Health Organization(WHO) project, the WHO stepwise approach for NCD risk factors in urban, rural and slum areas in Tamilnadu. In collaboration with the McMaster University, we then undertook the multi-centric study, the PURE study [Prospective Urban Rural Epidemiology study], the baseline of which has been completed and we propose to follow-up the cohort in the near future. In collaboration with the All India Institute of Medical Sciences [AIIMS], we undertook a multi-centric study, the sentinel surveillance of cardiovascular disease in the industrial population in Chennai. The MDRF was then identified as the regional centre for conducting non-communicable disease surveillance for the state of Tamilnadu. MDRF undertook the Integrated Disease Surveillance Project [IDSP] for the Tamilnadu state in co-ordination with the Ministry of Health and Family Welfare, Government of India and Indian Council of Medical Research [ICMR]. To carry out population based studies, to develop several cohorts across the country, and to run training programmes in Survey Methodology. The department has all the infrastructure, manpower and know-how to carryout large scale epidemiological studies. The department at present offers individually tailored training programmes in Epidemiology for national and international students. Sridevi K, Anu Diana, Ganga Kalyani, Sasikala, Vijayabaskar, Sathish Raj, Dhanasekar, Suresh, Deepa M, Ashok, Rahulashankiruthiyayan, Govindaraj, Kanchana, Rajeswari, Mohananeswari, Hemavathy, Anitha, Uma Shankari, Nazeera, Subhasini, Aberna.